You’d think that a budget of a couple of hundred bucks wouldn’t get you a decent massage chair but amazingly, that’s not true at all. One prime example is the Massaging Black Leather Recliner and Ottoman that has made it to our list of the best Massage Chairs under $500. Find out why in our full review below. Discover its strengths and weaknesses including how it differentiates itself from the other massage chairs at this affordable price point. 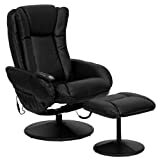 The Massaging Black Leather Recliner and Ottoman is one of the bestsellers for recliners and massage chairs mainly because of its affordable price and very comfortable sitting and reclining experience. For a couple of hundred bucks you get vibration massage with preset modes, heat control, and one heck of a comfortable chair. If you’re unlucky, you might get stuck with a glitched unit but overall, we have a fairly high opinion of it and buyers of this chair are generally satisfied. T & D Enterprises is a company that specializes in producing home appliances and furniture. They still haven’t really got much brand awareness in the massage chair market, but the chairs they’ve produced so far are solid models at cheap prices. Most of this company’s products have a 2-year warranty for parts. If a replacement part is needed, submitting a fax requesting the part is all that you need to do. The part is usually shipped within 24 hours. The first awesome thing about the Massaging Black Leather Recliner and Ottoman is its affordable price. We all want the premium $10,000 massage chairs but if they’re out of your financial reach at the moment you’ll be glad that companies like T&D are keeping you in mind. Yes, this just confirms how people are falling asleep on this chair. The Massaging Black Leather Recliner and Ottoman offers solid massage performance. It has 9 preset massage modes, 5 intensity levels, custom targeted massage areas, and you can even adjust how long you want your massage to be. These last two max out at 30 minutes though, which is a standard feature on most massage equipment. This heated massage chair is a cheap and great way to cope with back and lumbar pains as users have discovered. Pro-tip: The ottoman has vibration too. This is not made obvious in the product description so we just want to get it out there. Just plug in the ottoman and it’ll be good to go. A common theme with people who have bought the Massaging Black Leather Recliner and Ottoman is their amazement at how fast the shipping on this thing is. Always a great thing when your package comes speedily. Also, assembly appears to be a cinch for this product. In case you run into problems with a couple of bolts as has been the case in a couple of rare cases, you can head on over to the Amazon reviews and there’s a quick explanation on there in the Q&A. There have been a few cases wherein new chairs suddenly stop working after 5 or so minutes of use. The remote stops working too. Don’t panic. If the outlet is fine, the most likely culprit is the cheap power source plugin. Buy a new one from your local hardware and plug it in to test. If it works, it’s the cheapest fix ever. The Massaging Black Leather Recliner and Ottoman can get noisy when you set it to the medium or high settings. There’s also a difference, of course, if you’ve got it on a hard floor or on a soft plush carpet. People on the short and medium side tend to have great feedback for this chair and talk about how snugly it fits them. Tall customers say it’s still very comfortable for them (owing to the chair design), but complain that the arm rests feel low. The height on the Massaging Black Leather Recliner and Ottoman is not adjustable unlike the Relaxzen 60-425111. We haven’t experienced this for ourselves but a percentage of the buyers have reported that the base snapped off after 1-2 years of use. We’re not sure if its excessive user weight or how it’s been treated by these customers – but this is a good thing to keep in mind as you shop around for your massage chair. Would you be angry if the chair broke after two years, or would you calculate the cost per day and think ‘huh – it was still a bargain’? The Massaging Black Leather Recliner and Ottoman is a very comfortable recliner chair that comes with vibration massage and lumbar heat. If you’re looking for shiatsu massage or real leather, you’ll have to look elsewhere (and increase your budget). But, if you’re looking for a heated and vibration massage chair that doubles as an uber comfortable recliner, then this chair might just be perfect for you.